An alloy is a mixture of two or more metals. 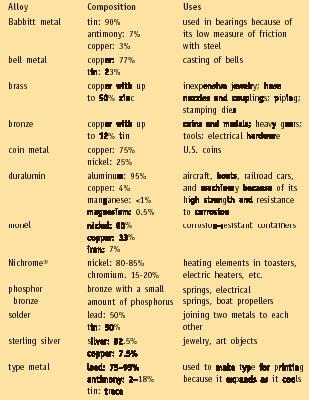 Some familiar examples of alloys include brass, bronze, pewter, cast and wrought iron, steel, coin metals, and solder (pronounced SOD-der; a substance used to join other metallic surfaces together). Alloys are usually synthetic materials, developed by scientists for special purposes. They generally have specially desirable properties quite different from the metals from which they are made. As an example, Wood's metal is a mixture of about 50 percent bismuth, 10 percent cadmium, 13 percent tin, and 27 percent lead that melts at 70°C (160°F). This low melting point makes Wood's metal useful as a plug in automatic sprinkler systems. Soon after a fire breaks out, the heat from the flames melts the Wood's metal plug, releasing water from the sprinkler system. Nichrome® nickel: 80-85% heating elements in toasters, electric heaters, etc. But what are examples of Alloys STEEL? Please help!! This is interesting and very useful article.I am registering to get more of it for future purposes.It is interesting to be here. The table given would be much more readable if there were horizontal rulings between the entries. And it is a mystery why the table is shown twice, once as a graphic and once as a textual table. I love this,it has really assisted me in my assingment.A job well done. Hi! I hope you can help me. I bought some Jewelry "findings" to make my own jewelry, but I noticed the package does not indicate what type of metal they are so I emailed the company. The reply I recieved? 50% brass and 50% iron. I am nervous to use these since they are "made in China" and wonder if there is anything potentially harmful in them, or if they may cause allergic reactions to some people with sensivity to certain metals. What is your take on the 50/50 combo they claim? It really helped me with my homework. I like the page. There are good points and examples are also good but content is too short and proper describing is not there. Thanku.. above alloys and its uses helpd me to complt ma project.. So helpful! Thank you so much! Now I can finally do my science homework. if one of the metal is mercury then the alloy is known as amalgam. This was interesting. I could learn a lot about alloys and it was cool too. Thanks for teaching! Lot of information is available to get full knowledge of alloy . Thanks so much. Am very greatful with this articles; it has help me a lot to do my home works. I have observed that an alloy is mixture of two elements or substances to for another element. it helps me a lot in my homework and science. Thanks for this it really helped me with my homework in science. I would have got detention.